Most dentists agree that chewing sugar-free gum is beneficial for the health of teeth! Many people group gum chewing into the same group as candy. However, this is hardly the case when it comes to sugar-free gum. In fact, most dentists may instruct their patients to chew sugar-free gum to help in cleaning the teeth and knocking loose any food particles after eating during the day. Of course, it should be mentioned that chewing gum with sugar does not have the same benefits and would be grouped into the same category as candy. Throughout the remainder of the article, references to "gum" indicate sugar-free gum. Not only does chewing gum help in knocking food loose from between and around teeth, the increase in saliva that gum chewing produces helps to wash award harmful acids. 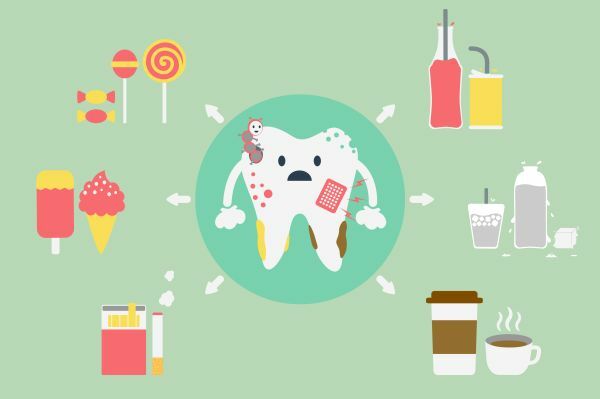 The acids that are glossed on and that stick to teeth throughout the day can be washed away with the extra saliva. Because of this, chewing gum can help in preventing this from happening which also prevents tooth decay and cavities. Overall, chewing gum has several benefits to help prevent cavities and tooth decay. It is great to do after a meal or after drinking a sugary drink. If someone has completed whitening treatments, especially ones at home, and now are experiencing tooth sensitivity, chewing a sugar-free gum could be a great solution. Again, because of the increase in saliva flow, it can help in reducing tooth sensitivity and washing away the properties that are causing the increase in tooth sensitivity. Xylitol, which is the main ingredient in sugar-free gum, has another great strength. It can greatly reduce the number of acids that are left behind by sugary drinks and foods. Because of this aspect, it is great at strengthening tooth enamel. By reducing the acids by using the xylitol, the enamel is not only cleaned but strengthened too. All in all, this is another great way for people to boost the health of their teeth by simply chewing some gum. Another benefit from chewing sugar-free gum is that it provides and supplies important minerals to a person's teeth including calcium and phosphate. Both of these are vital for strengthening enamel and are in full force when chewing sugar-free gum. For these reasons, many dentists agree that sugar-free gum is a great suggestion to their patients as a way to not only have a treat, but also fight decay, boost enamel, and preventing cavities. Do you have any other questions about sugar-free gum or tips to help in obtaining and keeping the best oral health? Give us a call today and we will be glad to help guide and direct you in making the best choices for your oral health. Give us a call and our staff can answer any additional questions, along with giving more tricks that you can use each day to ensure the best health for your teeth and gums each day! Request an appointment here: https://www.chiudentalcare.com or call Helen Chiu, D.M.D., P.A. at (973) 302-2065 for an appointment in our Florham Park office. Check out what others are saying about our dental services on Yelp: Preventative Dental Care.